Prime Minister Narendra Modi inaugurated a multi-modal terminal in Varanasi and received the first container vessel post-Independence on national waterway.In Varanasi, PM Modi received a large container vessel that left Kolkata inland port on October 30 carrying cargo belonging to PEPSICO (India). This is the first time that a container vessel travelled on inland waterways on the Ganga. This waterway has been named National Waterway-1. PM Modi also dedicated a multi-modal terminal to the nation. It was declared as a waterway in October 1986. It is navigable by mechanical boat up to Patna. 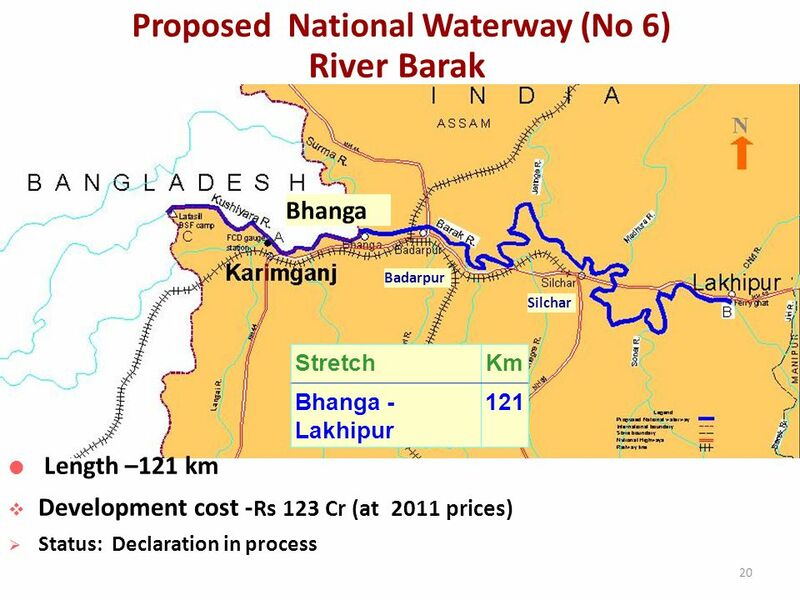 The Haldia-Varanasi stretch of the National Waterway-1 has been developed with technical assistance and investment support from the World Bank. The total estimated cost of the project is Rs 5,369.18 crore. The cost of the project was shared between the Indian government and the World Bank on 50:50 ratio. The project involves construction of three multi-modal terminals - at Varanasi, Sahibganj and Haldia, two inter-modal terminals and five roll-on-roll-off or Ro-Ro terminal pairs. It also has a new navigation lock at Farakka, assured depth dredging, integrated vessel repair and maintenance facility. Operation, management and further development of the terminal is proposed to be entrusted to an operator on public-private partnership model. The selection of the operator is at an advanced stage through an international competitive bidding. The process is expected to be complete by December end. 2- National Waterway -2 - ( from Sadia to Dhubri patti ) - Route to Dhubri patti from Saadia in the Brahmaputra river is known as National Waterway-2. The waterway was declared National Waterway ,started in 1988. The total length of waterways is 891 km .The important commercial center of the waterway are Dhubri, Gogigopa, Gwahti, Tezpur, Nimati, Dibrugarh, the Saadia and Saykhowa. 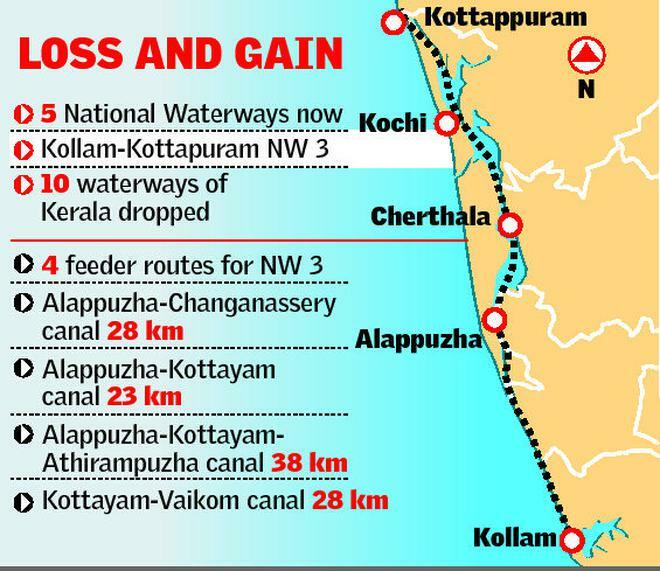 3- National Waterway -3 - (Kollam to Kottapuram) – In 1992 , water route through coastal rivers in Western India from Kottapuram to Kollym has been declared as National waterway – 3. Total length of the National Waterways is 205 km. 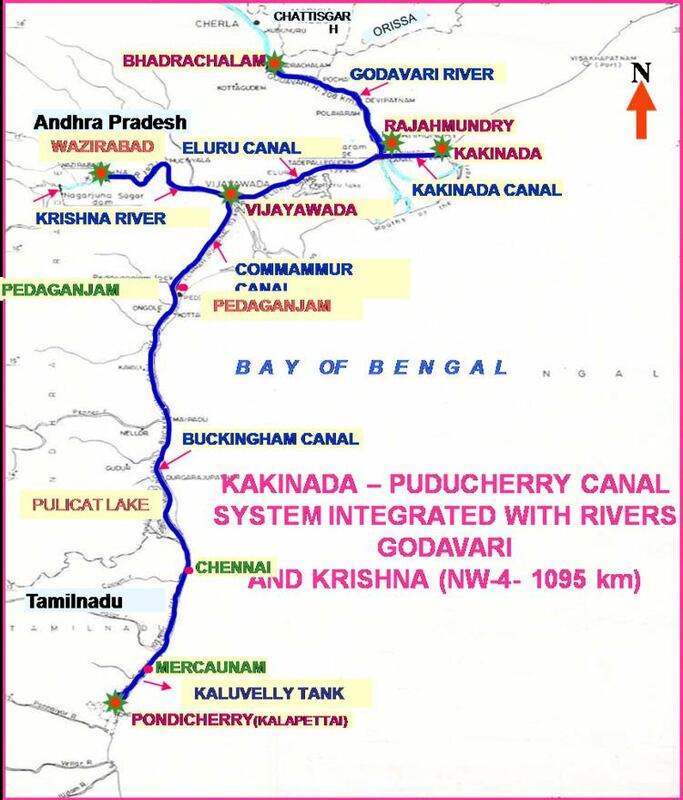 4-national waterways -4 - (Kakinada to Marakkanm) - route combined of expansion of Kakinada Puducherry canal , river Godavari and river Krishna is named as national waterways -4.. The length of waterway is 1095 km. This waterway connects Chennai port ports of Kakinada and Mchclipattm. 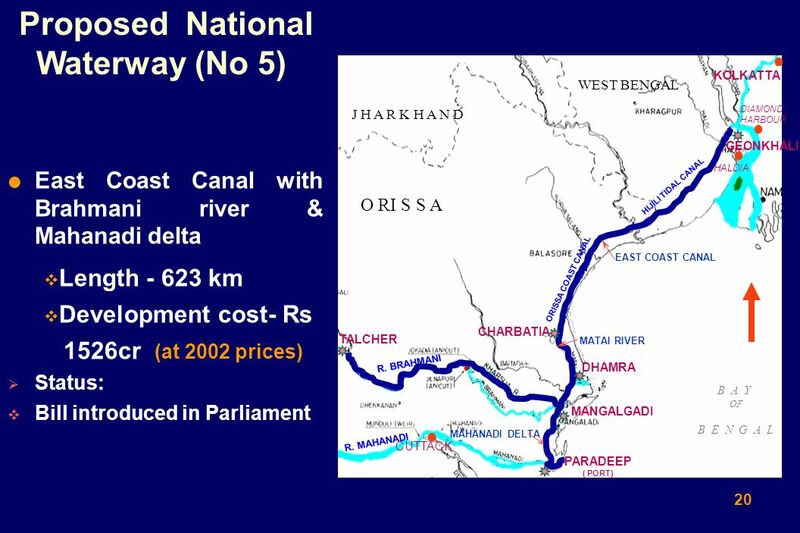 5- National Waterways -5 - (Talcher to Dhamra) - the eastern coastal canal system of Brahmani and Mahanadi delta region is known as the national waterway -5. It connects the 101 km waterway between Paradip and mangalgari. The total length of the waterway is 623 km. It was started in 1985 it was declared a national waterway in 2008.